Dutch designer Pepe Heykoop has worked with people from one of Mumbai's poorest areas to transform traditional water carriers into leathery vases. Based on techniques used in Heykoop's earlier Skin Collection, the project recycles Indian stainless steel water carriers called 'matkas' by covering them with high quality scrap leather. The patchwork of leather forms random patterns which are different on every piece. To produce them, Heykoop teamed up with Tiny Miracles Foundation, a charity that aims to raise one poor community living in Mumbai's red-light district to middle-class status within 10 years. Locals are now employed by Heykoop to make the vases in a workshop in the neighbourhood. Photographs are by Annemarijne Bax. Using distinctive techniques from his Skin Collection, Matka Vases are designed by Pepe Heykoop and produced in his workshop located in one of the poorest neighborhoods in Mumbai, India, providing meaningful jobs, income and hope for the neediest. Matka Vase is designed using recycled Matka's (traditional Indian stainless steel water carriers) and scrap leather. Every single vase contains a unique and personal story both of its previous owner and the person who gave it new life and use. Matka Vase has just recently gone into production and proceeds from sales are partly used to send street children to school. As a reaction to the huge amount of waste of high quality leather created by the furniture industry (25 up to 30%), Pepe has designed the Skin Collection in 2011. In 2012, the Matka vase was born. 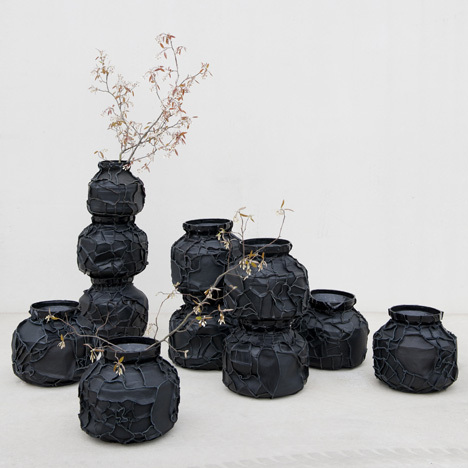 The scraps generate a unique and random pattern as every piece has a different shape, giving the Matka a new life by turning waste into a Vase. In this way, Matka's represent a signature product of Pepe Heykoop: they tell a story of change and growth, a different one for each unique piece of hand-made furniture. Thus it makes sense that his favorite materials are recycled; they are ready to tell a story and grow into a new product. Dutch designer Pepe Heykoop (28) recently set up a workshop together with Tiny Miracles Foundation right in the middle of the poverty stricken, red light district of Mumbai, India. In 2010, he started working with this community when he started manufacturing Leather Lampshades with jobless slum moms. These Lampshades became a global success. Pepe graduated from the prestigious Design Academy in Eindhoven in 2008 and has been awarded with multiple awards for his designs. Pepe has exhibited his works at numerous design shows including Milan, Singapore, Tokyo, New York and London and has his home base in Amsterdam, where most new concepts and products are born, based on unique low-cost techniques. Tiny Miracles Foundation is run by Pepe's cousin Laurien Meuter and focuses on one community in Mumbai, India. This 1,000 people community lives on the pavement in the middle of the red light district. The goal is to lift this community from 'very poor' to 'middle class' within 10 years and turn it into the 'City of Miracles'. Essential to making the community self-supporting is income generation. This will be realized through production in Pepe's workshop. Part of the proceeds are donated to the foundation to fund child education.